For 17 years, Bodgie Read has been a reliable force behind Fair Hill International and the Fair Hill Horse Trials, making sure each cross-country and stadium jump is painted, each sponsor has a sign on course, each dressage ring is set up, pinnies, dressage tests and score sheets are in order, judges are coordinated, and volunteers are recruited. 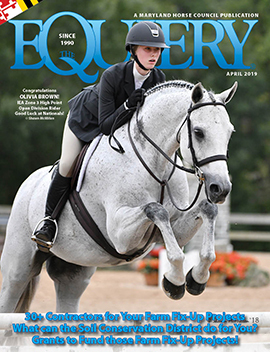 Indeed, Bodgie Read’s volunteerism spans time and organizations within the horse industry. And it is for such dedication that she is being honored with the Pumphrey Memorial Award. Read’s interest in the horse industry came by way of her father, the late Colonel Fair, a founder and former president of the United States Pony Clubs. Although Read was too old to join Pony Club when it was created, she began volunteering while her daughter was a member. From there, her involvement grew to her present position as Regional Supervisor for the Delmarva Region. In the late 1980s, Read began to volunteer at the new Fair Hill International. Her proximity to the venue made it convenient, and she’s been involved with FHI in one facet or another since then. Currently, she is in charge of the dressage phase at Fair Hill’s six horse trials, as well as many other odds and ends. the Energizer bunny,” she says. Read also volunteers at Freedom Hill Therapeutic Riding. It is her unwavering dedication to the equestrian community that will keep her from attending the Maryland Horse Council’s 20th Anniversary Party to accept her award. Instead, she’ll be volunteering at the United States Pony Clubs’ National Championships in Lexington, Virginia.